We had a great Marin Show, saw a lot of old friends and made some new ones. These days it becomes harder and harder for us to travel long distance for shows, so for the immediate future, we'll be doing Marin in February and don't plan any other shows. However, future history is always subject to change. If we decide to do a show somewhere, we'll let you know, but in the meantime, you can always give us a phone call or send us an email and arrange to meet us here. That's how a lot of those old friends got to be friends in the first place. And, if you're in New Mexico or Arizona, perhaps you can catch up with us on our August trek. We'll post dates and availability as we draw closer to the time. Make sure you see our best pottery book. 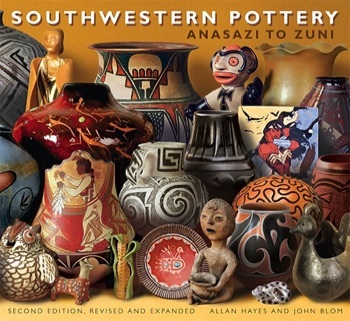 After 20 years, we updated Southwestern Pottery, Anasazi to Zuni into an expanded Second Edition with all new photographs and text. It's a lot bigger than the First Edition, and people tell us it's a lot better. NOTE: We encourage you to make it to any upcoming shows we announce. Sometimes pots get to the show before we they get to the site. Even though we update pretty much weekly, every so often a wonderful piece (examples: a rare 19th-century Mojave or O'odham figurine, a Hopi seed jar later attributed to Nampeyo and a bargain-priced Lucy Lewis) sells at a show before we post it.